IT was just another normal dday at the Jet’s Pizza in Mansfield. However, that all changed over the weekend when a Twitter exchange that would make most human resources managers cringe drew coverage from CNET, the New York Daily News, the UK’s Daily News Online and Many others.. In a nutshell, an unidentified person going by the Twitter handle @Cellla_ was hired to work at the pizza takeout place. Using PG-13-rated language, she tweeted that she was less than enthused about her new job. 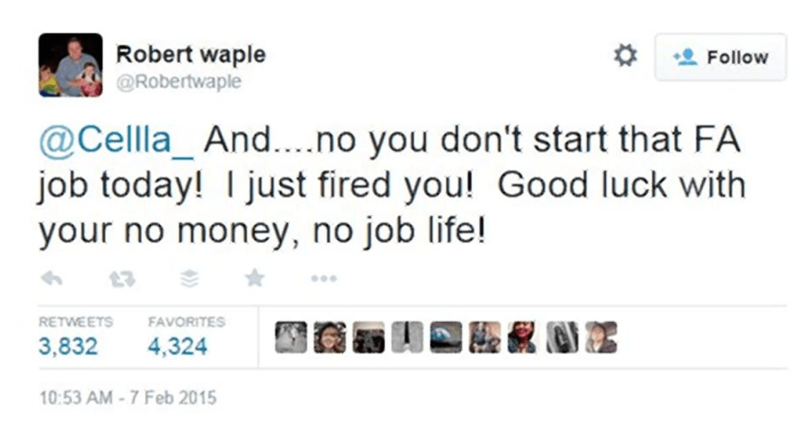 Reportedly, her new employer, Robert Waple, got wind of it, fired up his Twitter account (@RobertWaple) that had been dormant since 2009 and told her to not bother reporting for her first day. @Cellla_ tweeted back that she was fired because of Twitter and added three laughing emojis. The exchange went viral Sunday and support for @Cellla_ was pouring in from followers claiming to be from China, Saudi Arabia, Argentina, Egypt, Australia, New Zealand and Pakistan, among others. As of Tuesday, neither @Cellla_ nor Waple responded to messages requesting comment. In a statement Tuesday afternoon, Sterling Heights, Mich.-based Jet’s America Inc., said that because the Mansfield location is an independently owned and operated franchise store, Jet’s America “cannot dictate the employment practices or decisions of independently owned and operated franchise businesses, reports Fox News. Late Monday, just to see how things were going at Jet’s Pizza, I ordered a deep dish cheese pizza from takeout. Service was prompt and friendly. And business was extremely quiet with no sign that a viral social-media storm was raging. @Cellla_ the real question is, who the hell snitched on you to the owner. That was low key lame on their part. PreviousElderberry Recipes, A Cure For The Common Cold?